Sanborn Eagles Soaring. Sanborn sets the industry standard with their new fleet of cutting edge UltaCam Eagle cameras. 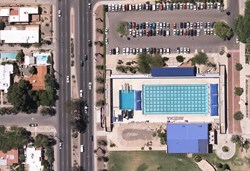 This image illustrates 3-inch resolution true color orthoimagery. A triple is one of baseball’s most exciting achievements, and so is mapping firm Sanborn’s recent triple. Sanborn beefed up its high-tech arsenal with three new UltraCam Eagle cameras, all purchased in one deal in early 2013. Management’s confidence the state-of-the-art technology would bolster the company’s product quality and productivity was well founded. UltraCam expert Craig Sweitzer, Sanborn’s data acquisition supervisor, can’t say enough about the Eagles. Sweitzer is one of North America’s veteran UltraCam operators, with more than 10 years of expertise. To date, Sanborn’s Eagles have mapped more than 40,000 square miles, from Los Angeles and New York to the Mojave Desert, at 3-inch, 6-inch and 1-foot resolutions, and customers are buzzing about the data. Sanborn recently completed a water management project in southeast Colorado for Colorado Springs Utilities. Land Based Services Supervisor Eric White, PLS, was delighted with the data. Sanborn is a preeminent leader in the exploding geospatial industry, delivering state-of-the-art aerial mapping solutions to customers worldwide. Using cutting-edge technology, Sanborn specializes in high-quality aerial and mobile LiDAR, aerial orthophotography, 3-D modeling and visualization, oblique aerial imagery and software development. The firm currently operates a fleet of 14 aircraft across the United States, and was the first company worldwide to employ three advanced Eagle cameras from Microsoft’s award-winning UltraCam product line. Sanborn’s technology advantage, innovative image processing expertise, a local presence nationwide and project management proficiency deliver unmatched value to its global customers. Learn more at http://www.sanborn.com.